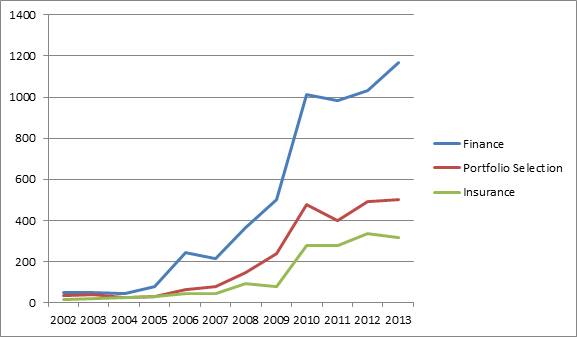 As the graph below illustrates, 2012 saw record numbers of patents issued by the United States Patent Office in the sub-classes related to insurance (334), finance (1034) and portfolio selection (494). So far, 2013 is on pace to basically match the number of patents from 2012 in these sub-classes. *2013 numbers are based on patents issued through April 26, extrapolated to 12-month rates. The rates have remained pretty steady since 2010 when the Supreme Court decided the Bilski case and the Patent and Trademark Office issued their Interim Guidance for Determining Subject Matter Eligibility. Despite the guidance being somewhat anti-patent on its face, the relative security of having specific guidelines appears to give the Examiners more confidence to allow cases and practitioners a better idea of how to craft their claims to meet the requirements. The CLS Bank v Alice Corp. case, which relates to what standards to apply to software patents, has the potential to change the slope of the lines on graph one way or the other. The United States Court of Appeals for the Federal Circuit should issue an en banc opinion in the CLS Bank case in the next few months. Patents in classification 705/4, which is titled “Insurance” have increased from a rate of about 25 per year over the first five years of the decade to 334 in 2012. Similarly, patents in the classification 705/36R, which relates to “Portfolio Selection” have risen from an annual rate of about 35 per year at the beginning of the decade to 494 in 2012. The “Finance” classification (705/35) has seen a twenty-fold rise from about 50 per year to about 1000 per year over the last few years. Interestingly, the number of published applications has actually been decreasing in these sub-classes over the last few years.